William Leonard Roberts II (born January 28, 1976), better known by his stage name Rick Ross, is an American rapper. He derived his stage name from the drug trafficker "Freeway" Ricky Ross, to whom he has no connection (Ross even sued the rapper for $10 million for using his name). 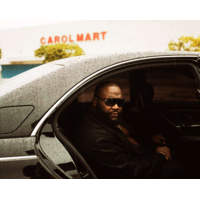 Ross founded the record label Maybach Music Group, on which he released his studio albums Deeper Than Rap and Teflon Don.